The PPMA Group Industry Awards returned for its seventh year, taking place at the Hilton NEC on the first day of the PPMA Show 2018 – the UK's largest processing and packaging industry exhibition. The awards bring together more than 300 industry professionals from processing and packaging industries to recognize those who excel in innovation, smart manufacturing and entrepreneurship across 12 award categories. Russell Finex was shortlisted for the Exporter of the Year, Innovative Processing System, Environmental Initiative of the Year and Outstanding Customer Service categories, and is delighted to have won the Exporter of the Year award, whilst also being highly commended for Outstanding Customer Service. Winning the Exporter of the Year award for the third consecutive year highlights the company's continuous investment in strengthening its contribution to UK manufacturing and expanding overseas operations. Established in 1934, Russell Finex is a global leader in the manufacture of high-quality industrial separation equipment, supplying to more than 140 countries across the world. Part of the company's success can be attributed to building and maintaining a strong global customer base, supported by local sales and aftermarket teams. Martin Chipperfield, Russell Finex Sales & Marketing Director, comments, “Winning the Exporter of the Year award for the third consecutive year highlights the continued efforts of our staff all across the world in strengthening our global presence and enabling us to expand into new markets”. Chipperfield continues "Being recognized as highly commended in the Outstanding Customer Service category is also testament to our customer service teams across the world whose focus is to ensure our global customer base receives only the highest level of customer service." 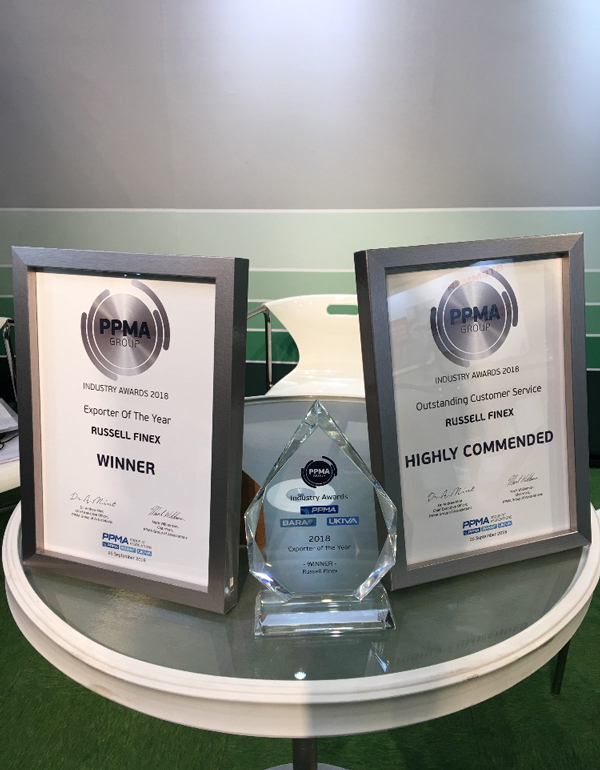 Russell Finex would like to thank PPMA for the accolade and congratulate all other winners. To find out more about Russell Finex and the extensive range of separation equipment available, contact us today.